Facebook boss Mark Zuckerberg and his wife Priscilla have welcomed a baby girl – and pledged to make the world a better place for her. In an open letter, the internet entrepreneur has revealed he and his wife will give away a huge chunk of their fortune, as a gift to future generations. Most parents lament the world their children are growing up in, and Facebook’s chairman and chief executive is no different. But Mark Zuckerberg and his wife have used the birth of their daughter, Max, to spell out just how they plan to address the world’s problems. In a Facebook post this morning, Zuckerberg announced that he and Priscilla are “so happy” to have welcomed their daughter, and penned her a letter detailing the world they hope she grows up in. In what Zuckerberg calls playing a “small part” in helping create a better world for all children, he says the couple will give 99 per cent of their Facebook shares (which currently equates to about US$45 billion) during their lives. In a poignant and detailed letter, Zuckerberg begins with the same sentiments we all have for our newborn children. The letter is full of hope and promise – of a world that is improving, but still has a long way to go. And of course, the new father insists technology is doing plenty of good in the modern world, “Technological progress in every field means your life should be dramatically better than ours today. The parents reveal that advancing human potential and promoting equality is what they hope their daughter’s generation will focus on. But he admits that the time is now, and for the world to keep improving, the parents of today have to commit to playing their part. 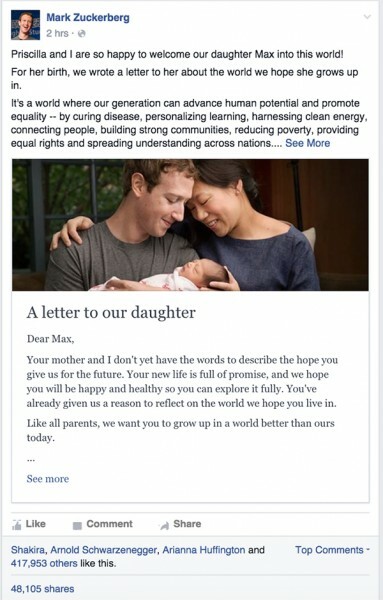 In the letter, Zuckerberg announces the creation of the Chan Zuckerberg Initiative, which aims at promoting equality for all children, initially focusing on, “learning, curing disease, connecting people and building strong communities”, which will be funded through Facebook shares. 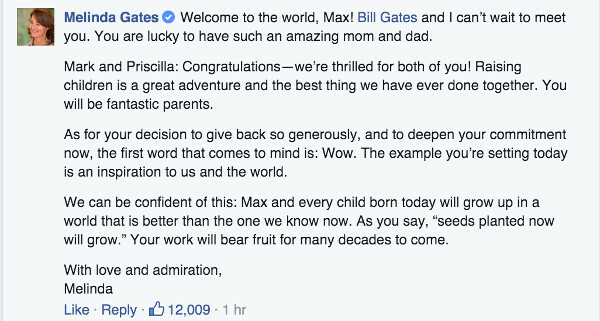 The post is being applauded worldwide, with many high-profile business people and celebrities congratulating the couple on the arrival of baby Max, and their commitment to the world’s future generations.